Regulus CS Pump Groups make a boiler installation easier because they contain all the important components necessary for boiler protection and proper operation of space heating and DHW heating. They are designed to be mounted directly on the boiler outlet pipe or on a wall. CS TSV maintains the return temperature at 65°C, preventing condensation and clogging the boiler by tar. Water for a heating system (i.e. 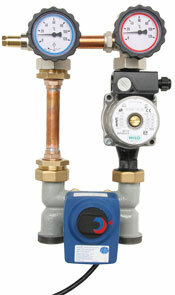 its heating output) is mixed by a 3-way mixing valve, controlled either manually or by an electronic controller. The heat surplus is stored in an accumulation tank and then supplied automatically when the boiler goes off. CS VMX Group is intended for all kinds of boilers. Both heating water and boiler water get mixed without throttling. CS VMX makes it possible to control both the return temperature of a solid-fuel boiler and the output of a heating system using one 4-way valve. Thanks to throttle-free regulation it can be used also for boilers with an integrated pump (usually gas-fired ones). Noise of closing thermostatic valves can be also eliminated using a bypass with an adjustable pressure difference. CS TSV Group is intended for solid-fuel boilers, no accumulation tank, DHW heating enabled. CS TSV maintains the return temperature at 65°C, preventing condensation and clogging the boiler by tar. Heating water is mixed automatically to a temperature corresponding to the boiler output. It can work at a low boiler output e.g. with a boiler temperature of 75/65°C and a heating system temperature of 50/40°C. The heating output is controlled directly on the boiler – e.g. by an RT2 thermostatic regulator or by a room controller.